Xquizit is a straight up veteran. Started his career in the Denver club scene. His residency at the legendary Tracks2000 alongside DJ Irene showed him the necessity for professionalism in the industry. Recruited as an opening act during the U.S. east coast leg tour of DJ Icey & Baby Anne during 2002 and 2003. Soon he relocated to Las Vegas to to tear the scene up there during 2004. After an Enlistment in the US Marines, he&apos;s back! DJ Xquizit&apos;s mixes are some of the most diverse and well-programmed sets around. With 15 years experience as both a master of ceremonies/host and DJ, Xquizit breaks the mold of what it means to be a DJ. 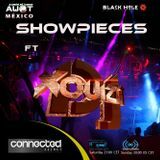 You can hear DJ Xquizit at clubs, raves, dance festivals, and special events in Las Vegas, Denver CO, Cancun, Honolulu, and other parts of north America, with residencies in all 4 cities. You can also check out the mixes as featured by ExaFM, KISSfm, and other top radio stations.